One of the most annoying cards to be released in awhile, News Team is NBN's new in-faction ambush, very often played as a passive central defense like Snare! or Shi.Kyū. As an non-advanceable asset trap that doesn't need to be installed, this can be shuffled into your deck to discourage digging, held in your hand to punish Legworks and Gang Signs, or installed on the board to bait an aggressive runner into it. Perhaps most alarmingly, this ambush will fire in Archives, meaning that if they access and trash it, they've just inadvertently turned Archives into a pit of nastiness. I feel this last point really needs to be stressed. You'll notice those other "choice" cards are ones that rarely see play, and there's a good reason for that. Allowing the runner to pick the least harmful punishment is a massive downside to any card. While it's easy to dream up contrived situations where both choices are terrible for the runner, in the vast majority of cases you're playing one of these cards because you specifically want one effect and not the other, and your opponent knows this as well. So clearly in most cases, the runner is just going to take the -1 agenda point and keep going. If they're Medium slamming R&D, then they're just going to eat this and....keep Medium slamming. If they've got a Clot down and are checking every remote as you drop it, they're going to eat this and...keep checking and trashing/stealing your remotes. If you're losing, News Team will delay your loss slightly (hopefully). If you're winning, News Team will make you win more (sort of). 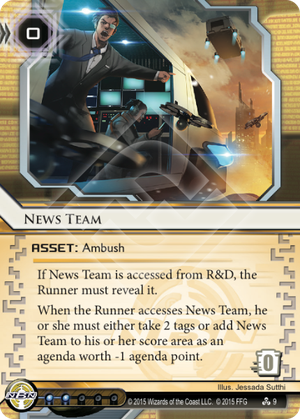 News Team really shines when the runner does NOT control the board, but is nonetheless racing you for agendas (with burst multi-access, for example, like The Maker's Eye). If you've got a reliable fast-advance strategy that can't really afford a strong central server defense, News Team might be exactly what you're looking for. But if you're looking for a new devilish way to tag the runner for your Scorch package or to tax them with SYNC, look elsewhere. If you can spare the and influence, Snare is almost always better. This is hands down my favorite ambush in Netrunner. It is either good (-1 agenda point) or it's great (2 tags) and it costs you no money. In addition to always being good it works from anywhere. That having been said, this card is a great example of the developer's skill at balancing and integrating with other cards. This card seems overpowered until you realize that it can be fed to Data Dealer for an absurd profit. In addition if you have the ability to go tag me the power of this card is reduced. so if you aren't packing significant tag punishment as the corp, news team becomes much worse. Also it synergizes well with SYNC: Everything, Everywhere and also Quantum Predictive Model. All in all it's a great ambush that like #snare will only win you a game outright if the runner makes a mistake but slows the game down to help you leverage your game plan.